We’d been informed of Tonkotsu by the ‘Cheap Eats’ article in the previous week’s edition of Time Out, so thought we’d give it a whirl. It appears that all the other bargain hunters in London had done the same. The place was heaving. We got ourselves a Japanese beer, Asahi, and settled in for the wait. To our pleasant surprise we didn’t have to wait too long for a table. We were soon seated and deliberating over the menu. (I have to mentioned that we had a special guest appearance from our friend, Alice, who joined us in Japan). From our table we could see the chefs working away in the kitchen (always a plus), and at the back of the restaurant there was a room with a glass wall where we could see a guy doing something with a machine. We were totally baffled by what was going on and explained it to ourselves as performance art. We were in East London. The menu isn’t particularly extensive, which made decision making easier. 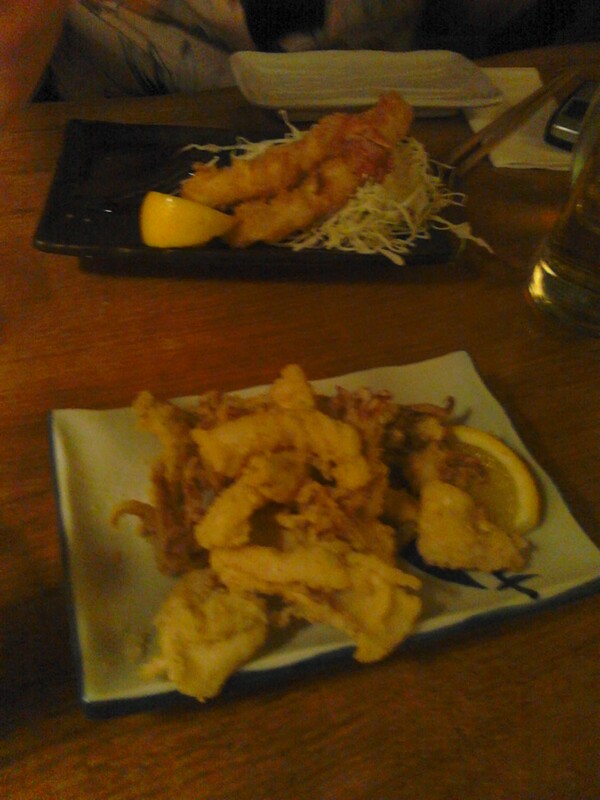 Alice opted for a couple of starters – King Prawn Katsu and Salt & Sansho Pepper Squid – with a side of noodles. Ruth went for Tokyo Ramen (pork and chicken stock, medium thick noodles topped with soy marinated pork belly, boiled egg, menma and spring onions. 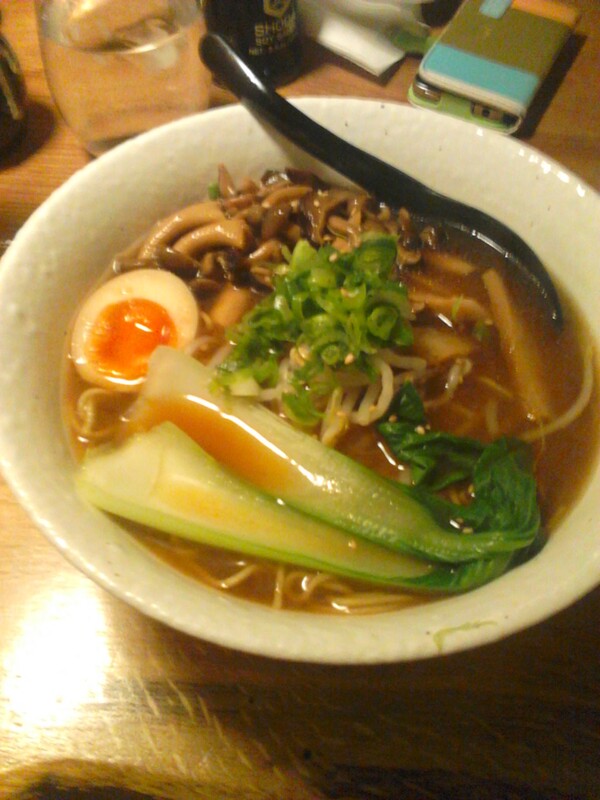 There was only one vegetarian dish, Shimeji, Shitake & Miso Ramen, which I had. 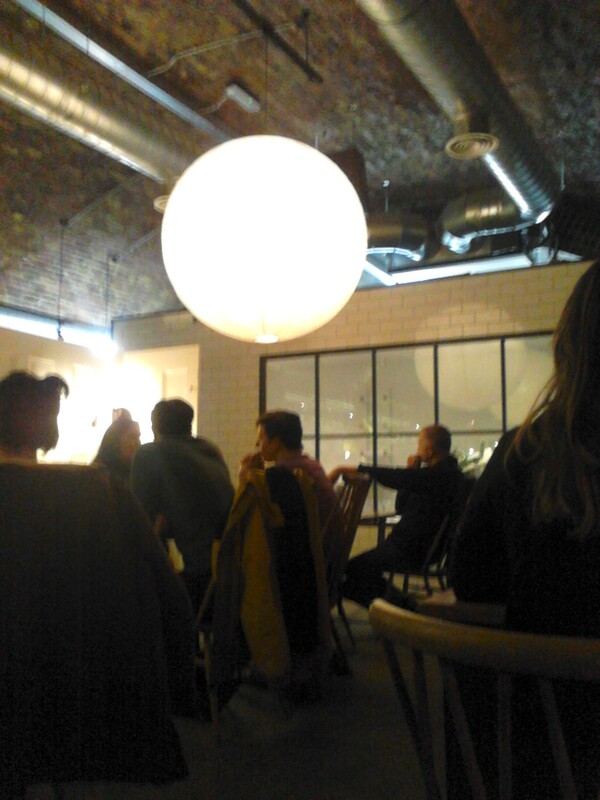 The all round verdict was that the food was enjoyable and tasty, and there was lots of it! However, Alice was slightly disappointed by her noodles. They were quite Supernoodle-y, served in a block. Rice noodles would have been a preferred option. 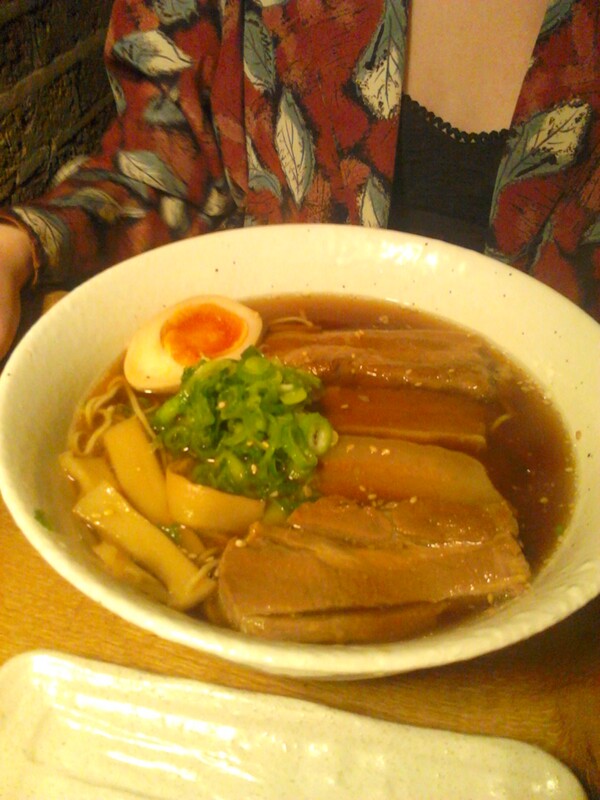 Ruth was particularly impressed with the Tokyo Ramen, describing it as “delish”. As regular readers may remember, she isn’t a big fan of pork, but this was succulent and went down nicely. The Shimeji, Shitake & Miso Ramen was tasty, especially with the added chilli sauce. Overall we were impressed with Tonkotsu and would definitely visit again. This entry was posted in Uncategorized and tagged Dining, dinner, Dinnergeddon, eating, Eating out, Food, Haggerston, Japan, London, noodles, Ramen, restaurants, Tonkotsu by dinnergeddon. Bookmark the permalink. Very nice photos. What is Shimeji? Excuse my ignorance…..